Day 45 - Another internet appearance. Concerning the lap of honour, there's a great little article on the official Newcastle United website. The article, entitled "Mark's a local hero" goes on to explain why I was invited to do the lap around the pitch at half time and how I was presented with a shirt, signed by the squad, by the new Chairman Chris Mort. You can see the article at www.nufc.co.uk. Day 45 - A mention in the match day programme and the Journal. There was a nice paragraph at the end of the Villa match report in today's Journal. 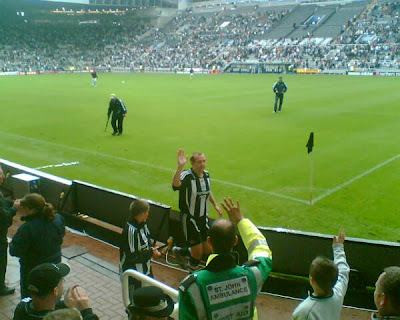 "Mark Allison, the Newcastle supporter who ran from John O’Groats to Lands End to raise funds for a local hospice, was applauded for his efforts during the interval. Unlike the 37-year-old, United still have a long way to go." Both the programme and the Journal made me a year older than I was but I'll not quibble too much about that! The plans for this week are a few short runs and a couple of sessions in the gym. By the time I get back to work next I'll start to get back to the usual quick lunchtime runs and more intense gym sessions. The aim now is to get my weight down to below 14 stone before the Christmas break! That will be a challenge in itself now that I'm allowed to drink beer and eat curries again! Day 44 - Living the dream! I mentioned to the lads in the pub after the match that I fully expected to wake up this morning at 18 stone again and having had the most amazing whirlwind of a dream. All in all this was a great day! Later on, I relived the half time lap over a few beers and a curry with the lads. I would never have dared imagine today's events would be possible when I set off from John O'Groats on July 7th amidst severe wind and rain. And I swear that my grin just got wider and wider as the night went on! At this point I'd like to thank Newcastle United and Gary Oliver in particular for looking after me so well yesterday. Thanks are also due to Rachel Kerr at the BBC for her superb coverage and wonderful photos. Thanks to a certain pair over at NUFC.COM for the part they played in getting the lap organised. Thanks also to today's new sponsors for adding to the fund which currently stands at £25,310. Day 43 - Was it all a dream? Day 43 - Like the best dream I ever had. What a reception on the lap of honour! And to be presented with a signed shirt by the new chairman topped it off superbly! Full report to follow tomorrow. Day 43 - What a result! This makes the shin pain, hamstring pain, exhaustion, blister pain, the mental pain, not seeing my family, running on my birthday, running in the wind, running in the rain, running in 29 degree heat, not drinking for 8 months, all the training, missing 2 home friendlies, missing the Bolton game, dressing up as Borat, dressing up as Batman all worthwhile. Don't forget that I got to beat a mackem work colleague who challenged me to running a marathon distance in the Cairngorms on day 7 of the big run. Despite him being 10 years younger, 5 stone lighter and me having run 160 miles already I still managed to destroy him and win the challenge. I hear on the grapevine that his confidence has been shattered and he hasn't ran since. He did manage to raise £1500 sponsor money in his own right though! This is separate to my total and will also be going to St Benedict's Hospice. The Pennine Challenge, undertaken by Northern Rock staff who joined me on day 16, also raised sponsor money in it's own right. At present, this is estimated to be in the region of £3000. This is also separate to my total and will also be going to St Benedict's Hospice. There were some pretty nasty injuries to some of the Northern Rock staff as a result of that run on what was a very very difficult course. One lad is due to have an MRI scan on his knee soon and Ian "The Coach" Glasgow hasn't managed a decent run since. Also due to a knee injury. The above total, standing at a very proud £25,120, would not have been possible without the publicity given to me by Niall and Biffa at NUFC.COM. Oh and by the way, as a little bonus from the tax man, the Gift Aid that the £25120 fund attracts is in the region of £5000. When I asked the 2 lads to publicise the run I expected a short piece on their site for a few days. Much to my amazement and utter gratitude, they stuck with me day a fter day on the run and kept you, the readers, up to date with my shenanigans. The run finished 5 days ago and I'm still on the site! Brilliant! Crikey, I hope, they remove me after the Villa game! I've been on there more times than Marcelino had injuries. I'd like to think I've been a good ambassador for the Geordie Nation. It's very fitting that the vast majority of pledges have been made by fellow Geordies, both at home and abroad. What a superb message this must send out about the wonderful people in our region and those who have moved away from it. I'll be accepting pledges, right up until the cheque is handed over to the Hospice on 27th September. News on this evening of gratitude, congratulation and cheque presentation will start filtering though on this site starting next week. We still need a venue, Geordie band, PA system and all sorts but we should manage to put on a do that is fitting for cheques of this magnitude. To say that this event has been a success is an absolute understatement. I set about achieving a certain result and boy did I deliver (with a lot of help from a lot of people). Not bad for putting one foot in front of the other a million and a half times in 37 days! 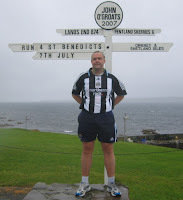 As the sign post read at Lands End, Geordie Pride indeed! Day 42 - £25,000 barrier smashed! Ian Mearns - "Just like the lads Top of the League. Well done mate!". Jon L - "Forget those overpaid primadonnas, there'll only be one star at St James' on Saturday.". Gordon - "Fantastic effort Mark, a real hero in black and white stripes for a change.". 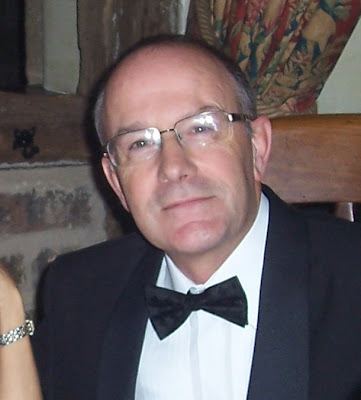 Brian J - "I have really enjoyed logging onto your Blog site. A tremendous effort, a true inspiration." Adrian S - "What a champion - I'll be cheering you even more than the 'lads' next Saturday.". T Bramble - "Go on son (can I come back?) 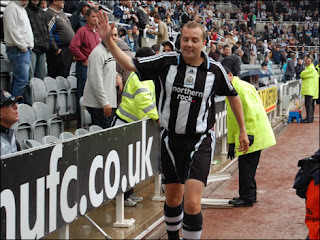 "
M Purdy - "You've already done more miles in a Toon shirt than certain players ever will!!! Well done mate...". Steve R - "Well done mate I just hope the Toon show half as much spirit as this in the new season.". Paul R - "Sorry I'm away today when you run past my house. I wanted to see the legend myself!". Kev (Crook Mags) - "In the land of the Prince Bishops,we pray for giveness in your shins. Just do it, for all of us.". Brigga Broggs - "Absolutely amazing! Makes me even more proud to be a Geordie.". Horsey - "Good luck kidda, well done on stuffing the Mackem!!! " 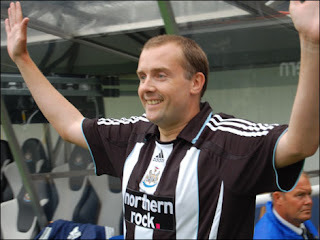 Dave Nelson - "Howay, Mark! Pledging an extra £10 for the first of 3 Toon wins over the Mackems this year!" Tom Bowlby - "Finest performance in a black & white shirt for a long time!". LJB - "Ultimate respect mark, all the best! NUFC players to join you as part of pre-season?" Day 42 - So close to a major sponsorship landmark! It's still hard to believe that the sponsorship amount for my efforts is just short of £25,000. That is an incredible amount and one that I did not dream was possible when I started planning the big run. I always thought that my initial target of £10,000 was possible so you can imagine how pleased I am with more than double that amount. Not to mention how pleased St Benedict's Hospice are! 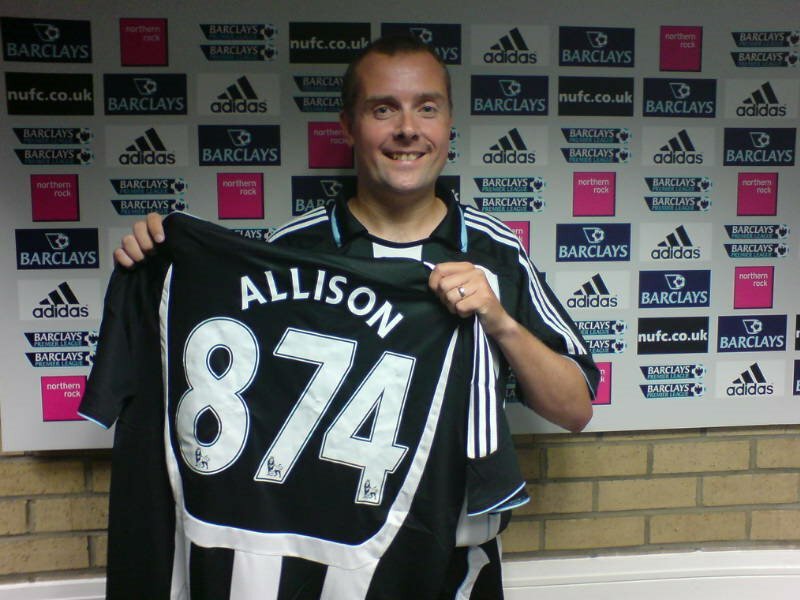 It would be brilliant if the fund reached £25,000 before I did the lap of honour around St James' Park tomorrow. Speaking of the lap of honour, I'm very excited about running around the pitch at half time. I'll be wearing the full home kit of course. My shinpads are in the wash so I'll be leaving them at home! Katy and Jack will be there to see the whole thing. It'll be Jack's first match. I found it daunting as a 15 year old going to the match for the first time (a 0-2 loss to QPR). Goodness knows how 4 year old Jack will cope with the noise. I've asked the club to play some music from the Rocky soundtrack during the lap. I think the adrenalin will be pumping so fast, I doubt I'll even hear the music. I think Local Hero might get an airing too. Hopefully, chants of "Who are ya, who are ya" and "You fat b*&^*d" will be kept to a bare minimum! I've been promised a few beers afterwards in The Bridge by friends and colleagues. Due to my lack of drinking lately, my mate Dan Tweedy has reminded me that drinking is "a marathon not a sprint!". Sound advice indeed from the man who has missed more matches due to hangovers than I care to remember! Day 41 - Getting back to normal 4 days after the run. I've found it very difficult to adjust back to normality since finishing on Sunday. My mind and body are still expecting me to run 20 odd miles a day. I have no aches or pains to speak of other than those acquired as a result of beating my press up PB on Tuesday! I managed to fit in a light gym session over lunchtime today and was introduced to a few new weight machines by Ian "The Coach". I've lost a lot of weight from my arms and these need building up again over the coming months. Now that I'm at 14 stone 11 pounds, the aim is to get down to 14 stone before the end of the year. The majority of this weight should come off while running around after Jack for the next couple of weeks. We've got a lot of playtime in the park to catch up on! Thank you to today's new sponsors. I still can't believe that £25,000 is within touching distance. Someone told me today that I had a mention on Vernon Kay's show on Radio 1 last Sunday. Fame at last! I wonder who was responsible for that? Day 41 - Random acts of kindess (Part 1). There have been a number of random acts of kindness during the course of the big run. I think it is worth highlighting them in the blog over the coming days. The first one I wish to speak of was by Bill Tweedy (pictured). I reckon his wife Linda had a big part to play in this too. Bill and Linda are the parents of my mates James and Dan Tweedy. It was Bill's 60th birthday bash on day 30 of the big run. I was running through Bristol around this time so, unfortunately, I couldn't attend. At the party, Bill and Linda had placed envelopes on the guest's tables and asked everybody if they would like to contribute the price of a pint to the run fund. It seems some of the contributions were very generous and Linda later commented that "some of them must have thought you only drank Cristal Champagne!". A lot of Bill and Linda's old neighbours were there and they remembered my Mam from her days as a dinner lady at Holley Park school in Washington. Bill and Linda used to live near the school you see. The first I knew of this whipround was when a donation was made via the justgiving website. It was for £180 and made by "Party Animals". The comment with the donation read " Missed you on Sunday. Here's what we saved buying you drinks!!". I racked my brains but I couldn't think who the Party Animals were. Then the penny dropped! I must say a special thank you to Bill and Linda for taking time out and remembering my run on Bill's special day. Thanks to the very generous party guests are also due. 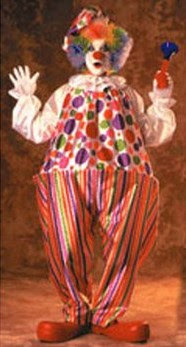 Pictured to the right is Bill in his Sunday morning "reading the paper" outfit. Day 40 - On the Beeb! As promised, Rachel Kerr has written a great article on the BBC Tyne website about my run. "As far as the future goes, you get the feeling that it won't be long before he is pulling on his trainers again for another challenge. He said his ambition is to run across America from east to west...". Thank you to today's new sponsors. The fund is creeping towards £25,000! Day 40 - Busy times "off the pitch". I had my fitness assessment yesterday afternoon (pictured) and I was pleasantly surprised with the results. The most meaningful figures to the man in the street are of course weight and body fat. Well, I'm pleased to report that during the course of the run I lost over 2 stone. I went from 17 stone 1 pound to 14 stone 12 pounds. Considering I was 17 stone 8 pounds in January then this is some loss indeed! I can't remember the last time I was 14 stone anything. I think it was perhaps 1998, just before I went on a 3 week drinking holiday to Australia with my mate Adam! My body fat percentage was 27% at the start of the run. Amazingly, this is now down to 19%! That's an 8% loss in body fat. In January, this figure was 35%! That's a whopping loss of 16% body fat in 8 months. The likes of this have surely not been seen since Mick Quinn was on Celebrity Fat Club. There were improvements for figures concerned with lung function, blood pressure, resting heart rate and cardiovascular condition (V02). The V02 score was in the highest range and according to the assessment report "compares well with sample scores of international athletes". With respect, I think this must be referring to Brendan Foster as he is now! Never mind all those meaningless stats though. I had a press up record to beat. The previous PB was 20 in a minute, achieved 2 days before the run started. I made a good start with the press ups and after the 10th one remembered to breath! With 5 seconds left I managed 21 in total before collapsing in a heap on the floor. What a victory! Almost as good as getting to Lands End! I managed a 40 minute session in the gym afterwards to celebrate. Earlier on yesterday I spoke to the BBC Tyne website and they will be putting an article on the BBC Tyne website soon. It was cliches all the way! I'll post a link to the article when I have it. I also had some correspondence with the justgiving website who want me to attend a "superuser" group. The idea is to find out if there is any advice that could be passed on to the larger justgiving.com community, resulting in everyone being more successful. There was also mention of me being the justgiving.com fundraiser of the month. This is great news as it attracts a £50 donation to the fund. This morning, I spoke to Paul Tully who is the editor of the Newcastle United matchday programme. He seemed like a smashing bloke and was full of congratulation. There'll be an article about my run in this Saturday's Aston Villa programme. I've been racking my brains to try and remember how many times I've been in the programme over the years. As far as I can remember the first time was when I, how can I put it, decided to take annual leave from school. It was January 1986 and the pitch at St James Park was full of snow. Me and my mate, Mark Huck, turned up to help clear the pitch after hearing an appeal on Metro Radio. I t was a brilliant day. We must have cleared 10 square feet of pitch and I remember getting free fish and chips as a reward. A group of us had our photo taken and it subsequently appeared in the programme. The Spurs game the next day was still called off mind. The highlight of the day was getting hit by Derek Wright with a shovel full of snow. The next appearance was in the 1992/1993 season. 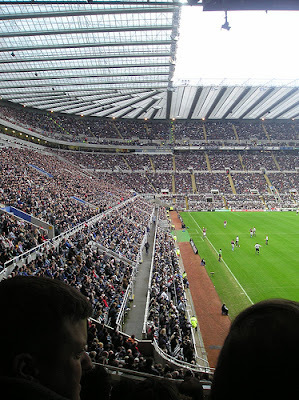 Again, me and my mate Mark Huck, were part of a photo that showed a huge section of the Gallowgate End. It was the first game of that promotion season against Southend and the photo appeared in the next programme. I think Mark's brother Neil and our friends Dan Tweedy, James Tweedy and Graham Robertson can all be seen in the photo. My final known appearance was in 2002/2003 where I did an interview for a Football Aid match that I'd previously played in. The match itself was back in May 2002 and I wore the number 9 shirt. It cost me £1000 and my missus went off it when she found out what I'd don e with the housekeeping! Now the following might not be entirely accurate but you know how it is! 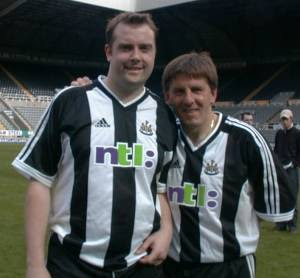 Peter Beardsley was my strike partner wearing the number 8 shirt. 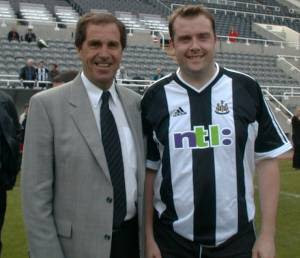 Manager Bob Moncur led us to a 5 - 2 win. The game seemed to pass by really quickly and I remember dragging a centre half away and Beardo ran into the space I'd made and scored a trademark sidefoot goal. I scored a belting header at the Leazes End that Sir Les would have been proud of. Unfortunately, it was during the pre match warm up! at the side of the pitch. Peter did about 10 and so did John before I wellied the ball into the Milburn Stand! HAVE IT!!!!! Moments later, Sir Bobby Robson arrived to do an interview. He was a patron of the Football Aid charity. After the interview I got to talk to him for 5 minutes. He took one look at me and said "Did you manage to last the whole 90 minutes?". We then talked about my Mam's Uncle - Charlie Wayman. Charlie played for Newcastle in the forties and was a prolific little goal scorer. Bobby remembered lots about him and it was great to talk to one of the finest men I'm ever likely to meet. Day 39 - The pledges and the messages just keep on coming. Despite the run finishing on Sunday, my inbox is continuing to be filled with congratulatory messages. Also, the pledges just keep on coming and coming. Thanks so much to everyone! I'm finding it very difficult to wind down after the big run and will be continuing to run or go to the gym for some time to come. I always anticipated a period of de-training to bring me back down to earth. After a month or so, this phase of training will cease and I'll get back into the old routine of lunchtime and weekend running. Training without any major focus or goal will be very strange. I suppose the goal now is to reduce my weight even further and perhaps enter some weekend runs in the region. Secretly though, I've got to start and give those Northern Rock runners a run for their money! I've got a fitness assessment in the gym at 13:00 today. Hopefully, I'll see at least a 2 stone loss in fat weight and improvements in all other areas. Most importantly though, I've got a a PB of 16 press ups in a minute to try and beat! Adam Cook (My mate and an exiled mackem in Jacksonville, USA) - "Just finished reading the closing entries on your blog. I know I am just echoing the hundreds of other messages you have received, but I just want to say how proud I am of you for this super human effort. I never knew your Mam, Dad and Brother and you've never really talked about them to me, but I do know they produced and raised a big-hearted and devoted son and brother and I'm sure somewhere they are brimming with pride at your efforts over the past 40 days. I'm proud to be able to call you my mate Mark and look forward to hopefully sharing a beer or two with you in the not too distant future. Enjoy your big day at St James next week. (Make sure you stretch. You don't want to pull a hammy in that massive 300 yard final leg). 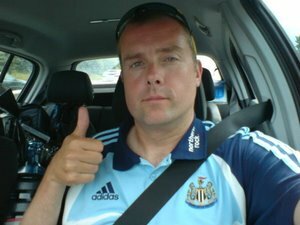 Dave Lynn (Queensland, Austrailia) - "Dear Mark, As an exiled Geordie I have followed your run via NUFC.com and I just wanted to thank you for an inspirational and emotional few weeks. Every day I have been following your journey from here in Australia. Whilst I cannot begin to imagine what your effort physically felt like I can sort of imagine what the messages of support and encouragement did for you and I can definitely imagine the feeling you will have on your lap of honour at the Villa game. I will be watching on Fox Sports and hope that there will be at least a glimpse of your lap. Enjoy it! No one deserves it more than you. The least they can do is make sure we get three points to go with it. That would make it a fitting tribute. Cheers mate and well done. Martin Scott (Watford) - "Mark, I don’t know how you did it! I kept an eye on your progress through your blog, and still can not believe how you managed to stay focused and determined for such a long period of time, over such a mammoth distance. I managed to complete the 26 mile breast cancer moon-walk during May, but my effort pales into near insignificance in comparison with what you have achieved over the last few weeks (not forgetting the massive amount of training required beforehand). As an exiled Geordie in Watford, you have been a reminder of what it means to come from our part of the world. All your family and friends are lucky to know you, and you should be immensely proud of what you have just achieved. Enjoy the welcome you so richly deserve when you get back home, and during your lap of honour at St. James’ Park on Saturday. I wish I could be there to congratulate you in person. Congratulations, and enjoy the rest. Craig Swallow (Warwickshire) - "Mark, I just wanted to add my congratulations to all of the other thousands of emails you must have received. I'm a runner also but I average a week what you have done each day for over a month. Its amazing that you have had the mental and physical will to continue and to finish with no injuries is just remarkable. Like you I also lost my mum (and nan & grandpa) to cancer, she was 56. I started running to raise money, first for the Newcastle General who looked after her and subsequently for Cancer Research. I was never a runner at school, I preferred team sports. Somehow though, the memory of loved ones lost propel me along as they have clearly done for you. Your mum will be smiling down and be massively proud. Enjoy Saturday, I'm an exile-mag and living in Warwickshire now. You need to get yourself a contact at the BBC before the weekend and make sure they show your lap of honour on MOTD! Congrats again, put me down for a book if you do write one. Chris Smith (Gibraltar) - "I am an exiled Geordie working in Gibraltar. I’ve already sent you one e-mail but I couldn’t resist sending another one. What you’ve done is amazing. You have definitely inspired me (and no doubt many others) to get out training when I would rather have stayed in the house. What’s a 10km run when you are doing 40km a day? Your attitude is a lesson to all of us and you deserve all the credit you get. You have made a difference to an amazing number of lives – not just with the money you have raised but in the way you have set about doing what you have just done. I have forwarded your website to all my friends here so they can see what I mean when I tell them Geordies are the salt of the earth. Congratulations – you deserve all the praise and credit you will now receive. ...I wish I'd never been away. Katy, Jack and I arrived home safely at 20:45! 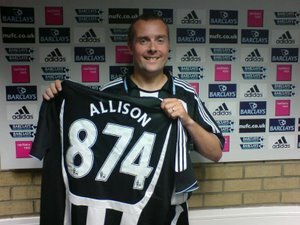 Thanks ever so much for all the new pledges today and to NUFC.COM for giving me top billing most of the day. The fund has just topped £24,000 and I've just had a message from Anne Oliver at St Benedict's Hospice. To say she is pleased is an understatement! Thanks also for the many messages of congratulation today. It's just amazing to see the far reaching effect that this run has had on a great many people! Day 38 - The long journey hyame. There are still 300 miles left to drive before we get back to the North East. It's very peculiar not running but I could get used to it! Thank you to the new sponsors today. The fund will remain open right up until the cheque is presented next month. It's also a bit strange driving along the route that took many days to run. The next milestone for me is a fitness assessment in the gym tomorrow. The last one I had was 2 days before the run started. The results should make for interesting reading. Day 37 - Thank you! There are so many people to thank, but for now, I'd like to give special thanks to all the NUFC.COM readers for their pledges totalling over £14,000. The grand total now stands at a magnificent £23,080. Thanks also to those people who have sent congratulatory emails. It's now after midnight and I've just managed to read through them all. Just brilliant! I'll get round to replying to you all in the coming weeks. It'll be a long journey back to the North East tomorrow for the support crew and me. We are in no hurry though. I think it will be quite strange not having to run 20 odd miles and posting updates to my blog with the progress. That said, I will be updating the blog over the coming weeks with those daily reviews that were missed and any other items of post run interest. I'll also be adding a review of this Saturday when I run round the pitch at St James' Park. I'm really looking forward to that and I've paid someone a fiver to ask for my autograph when I pass the Gallowgate End! 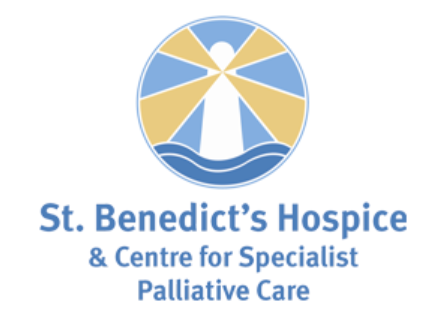 I think for my own sanity, I'll be posting updates right up until the cheque is presented to S t Benedict's Hospice on the 27th September. I've got some big plans for that night and Katy and I will be as busy as ever planning it. Are Ant and Dec available to host it I wonder? I see that night being a bit like the Oscars as there are so many individuals who played a part to thank and pay tribute to. Support men Rab C and Jeeves have already got their hotel rooms booked in Newcastle for that night. And I hear that For Your Eyes Only are stocking up on Cider! After that, it'll be a case of becoming Billy Normal again. Though, after over 100 requests, I'd like to write about this experience. I think a book, with all proceeds going to charity, would bring about a nice bit of closure on this most extraordinary tour of the UK. Based on the interest shown, I've already got 100 copies sold and there must be thousands out there in need of a good hefty door stop! This is Mark Allison signing off from the 22nd (I think) base camp near Penzance. May tomorrow bring absolutely no running whatsoever, (PLEASE) no hangover. May tonight's dreams be filled with thought's of glory, my legitimate pitch invasion this weekend and the hope that the league table stays the same for the next 10 months. Day 37 - The finish in photos (part 6). Day 37 - The finish in photos (part 5). Day 37 - The finish in photos (part 4). Day 37 - The finish in photos (part 3). Day 37 - The finish in photos (part 2). Day 37 - The finish in photos (part 1). Day 37 - Praise from one of thee Geordie greats! Day 37 - I did it!!!! Day 37 - I can (almost) see the pub from here. Day 37 - A banana stop with a difference! Day 37 - To dream the impossible dream. Day 37 - 7 miles done and feeling good. Day 37 - To absent friends. Day 36 - It's all set up for a grand finale. Day 36 - A quick finish to 26.5 miles. Day 36 - 17 mile banana break. Day 35 - There in spirit. Day 36 - Feeling in good form. Day 36 - Another scorcher. Day 35 - 50 miles left! Day 35 - Many thanks. Day 35 - Poor reception. Day 35 - Time to use the force. Day 35 - You lot are my inspiration. Day 35 - Double beans! Day 34 - At the foot of Bodmin Moor. Day 34 - Half time. Day 34 - The straw breaking the camel's back. Day 34 - Inspiring emails and text messages. Day 33 review - Eventful to say the least! Day 33 - Soon to be running in the dark! Day 33 - Taking a right beating. Day 33 - A scorching day in the hills of Devon. Day 32 - Devon is a place on Earth. Day 32 - Backed by Devon and Cornwall's finest! Day 32 - Good for a laugh! Day 32 - Another transitional day. Day 31 - Rab C's new tipple! Day 31 - Time for a snooze! Day 31 - Achy Breaky Legs. Day 31 - Go West! Day 30 - The path to glory gets ever shorter. Day 30 - More brilliant support. Day 30 - Suspicions confirmed. Day 30 - 8 miles done in hottest day so far. Day 30 - Come fry with me! Day 29 - I'm glad we crashed the wedding! Day 29 - An early banana stop. Day 29 - Overcast and a little cooler. Day 28 - Another good haul of miles. Day 28 - Baking hot. Day 28 - Amazing support continues. Day 28 - The ultimate reward! Day 27 review - A landmark day! Day 27 - 22.5 done. Day 27 - Major Sponsorship landmark. Day 27 - Time running out. Day 27 - Overcast and cooler. Day 27 - I want one of those! Day 26 - 607 not out! Day 26 - Slow going.